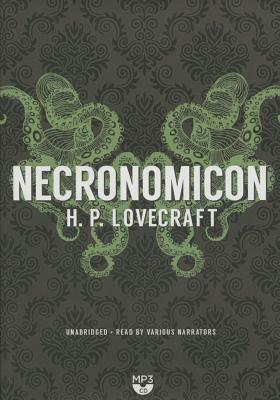 The only audio edition of Necronomicon authorized by the H. P. Lovecraft Estate Originally written for the pulp magazines of the 1920s and '30s, H. P. Lovecraft's astonishing tales blend elements of horror, science fiction, and cosmic terror that are as powerful today as they were when first published. This tome brings together all of Lovecraft's harrowing stories, including the complete Cthulhu Mythos cycle, just the way they were when first released. It will introduce a whole new generation of readers to Lovecraft's fiction, as well as attract those fans who want all his work in a single, definitive volume.Stories include: DagonHerbert West - ReanimatorThe Lurking FearThe Rats in the WallsThe Whisperer in the DarknessCool AirIn the VaultThe Call of CthuluThe Color Out of SpaceThe Horror at Red HookThe Music of Erich ZannThe Shadow Out of TimeThe Dunwich HorrorThe Haunter of the DarkThe OutsiderThe Shunned HouseThe UnnameableThe Thing on the DoorstepUnder the Pyramids.